What makes Ireland’s top performing academics stand out? What do top academics do that sets them apart from the rest? A recent paper sheds some light. Hidden in that is some interesting analysis on Ireland in comparative perspective. 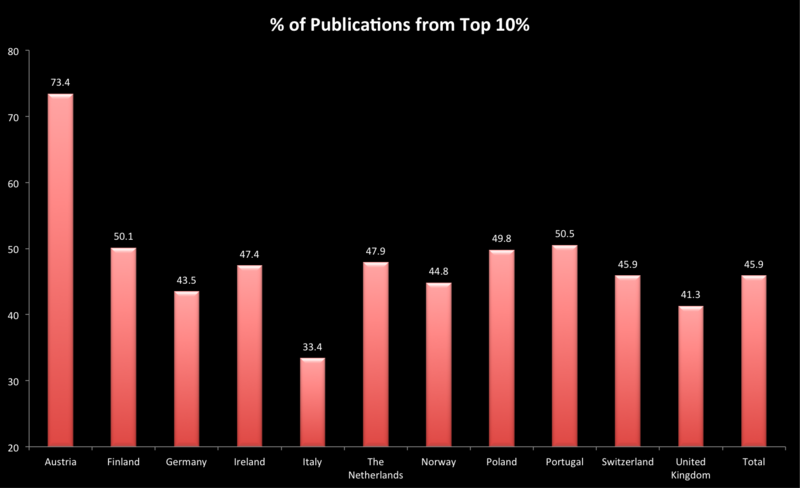 Defining the top publishers as those that are in the upper decile of national output, the survey also looks at national differences. It is adjusted for time differences between when classes are in session and out of session. Because, despite what is thought, universities are not just secondary schools for those that can legally drink, but also have postgraduate, administrative and research roles to fulfill. Ireland comes out ok in terms of raw productivity. We are neither the best nor the worst. Its when you get down to what makes top researchers so productive that things get interesting. Top researchers simply work more than the rest. They do more administration, put in much more time into research, do more other (fundraising, outreach). Internationally , they also do more teaching. This is not the case in Ireland, reflecting the very different IoT v University teaching contractual requirements. So what, across the board, makes an individual a top researcher? Statistical analyses surfaced a number of determinants , alto I suspect there are some concerns about endogeneity not fully addressed, but the ones that really stood out were ; academic rank , the amount of hours spent per week at research, being on national or international boards or committees, being a regular peer reviewer and being on an editorial board . Perhaps what is more of interest is that availability of research funds, the attitude of the higher education institution, nor the age of the researcher really mattered. Full details are in the paper and the supplementary data. So, TL:DR – put in the hours. Actually, just one extra per day. Thats it. This entry was posted in Blogpost and tagged Academia, productivity, research on July 10, 2015 by brianmlucey. 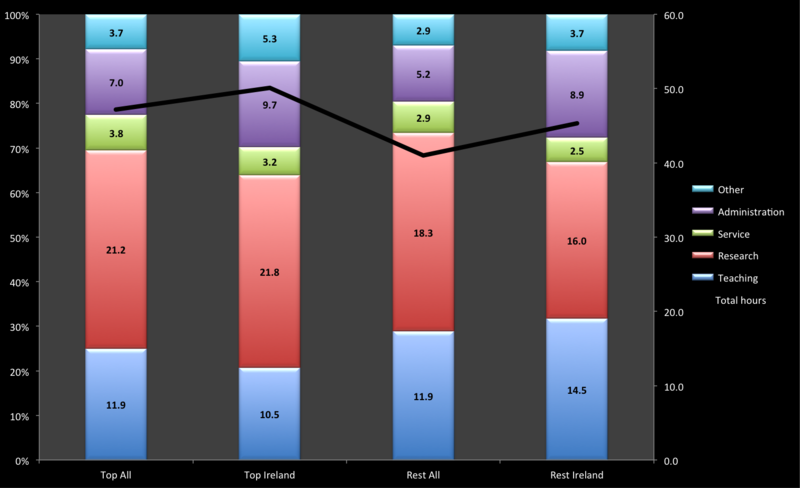 Pingback: Ninth Level Ireland » Blog Archive » What makes Ireland’s top performing academics stand out? There are two ways you can look at this: the first is that lots of academics need a boot up the arse and should work harder (a little bit simplistic and often unfair I think); the second is that the ‘system’ is failing to get the best out of its biggest and most expensive asset – its staff. But this failure is actually quite deliberate in a funny kind of way. It is almost a given these days that university strategic plans (Trinity and UCD might be exceptions) are based on the idea that the institution in question should focus on a small number of key areas in which it can aspire to international excellence. (These areas tend to be linked to national and EU funding policies.) This automatically disenfranchises many staff who, often understandably, find it difficult to maintain a research output. The ‘chosen few’ prosper and the whole thing becomes self perpetuating. (Of course the really talented have that rare ability to transcend all of this.) The point is that in a highly ‘strategic’ funding environment, this unevenness of research output is completely unsurprising and essentially deliberate. Institutions would much rather a small number of Ronaldos than a large number of James Milners. Incidentally it would be interesting to see to what extent the output from the high-flyers is double-counted. In these days of large research centres, especially in STEM, I suspect that much of the output of the top 10% involves collaborations with each other. Hi Greg both can of course be true…Too many outside the tent and too few within doing the work. As a friend o mine says, ‘one paper is infinitely more than none’. Producing nothing is unacceptable for sure but keeping up with the big guys may well be out of your control. My view is that every academic should try to produce some sort of regular scholarly output – it doesn’t have to involve huge labs and lots of PhDs and postdocs, but everyone should be willing and able to do something. If there are large numbers of people in the Uni sector producing zero, then that is a failure of the system – Performance Management anyone? It might also be that the top percentile are those lucky academics that have found themselves in exactly the right area, i.e., an area where they truly do have an unusual talent and in which there is room for new work. A bit like a good musician finding the right instrument!